“The Price of Cold” — the story of my recent adventures exploring China’s artificial cryosphere — is now online in The New York Times Magazine. In it, I visit the world’s first and only frozen dumpling billionaire, hang out with the chef leading a one-man refrigeration resistance movement, and visit refrigerated warehouses and R&D labs across the country. In my completely unbiased opinion, it’s a lot of fun, and you should read it right now — and then share it with all of your friends! Meanwhile, for those of you for whom that is not enough refrigeration for one weekend, I compiled this list: ten stand-out destinations for the armchair Chinese cryotourist, based on my own travels while reporting the story. IMAGE: All ten destinations, mapped. 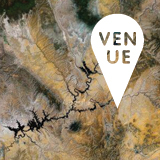 From the “Room of the Sleeping Fish” in Jinan to a Wal-Mart in Zhengzhou, these places are both extremely obscure and yet globally significant. Together, they help tell the story of how refrigeration is changing the way Chinese people farm, eat, and shop — in exactly the same way it changed the American and European landscape and diet, and yet, of course, with a uniquely Chinese twist. Chen Zemin is the official Father of Frozen Food in China, Sanquan is his frozen dumpling company, and frozen dumplings are the the Swanson’s TV Dinner of China — the gateway convenience food paving the country’s path towards a future of chilled prepared meals and frozen entrees. My New York Times Magazine story includes these facts and much more besides, including Chen’s life story and a gorgeous photograph of the Sanquan factory floor taken by Massimo Vitali. But neither my words nor Vitali’s photo quite bring to life the mesmerising process of making 100,000 dumplings an hour. For that, until your next visit to Zhengzhou, you will have to make do with these iPhone videos (forgive the quality). VIDEO: The glutinous rice ball production line at the Sanquan factory, Zhengzhou. The entire process takes 20 minutes from start to finish. People dressed in white jumpsuits are line workers, those in pink are production line supervisors, yellow are quality control, and blue are mechanical support. All photographs and video by Nicola Twilley. VIDEO: The frozen dumpling production line at the Sanquan factory, Zhengzhou. 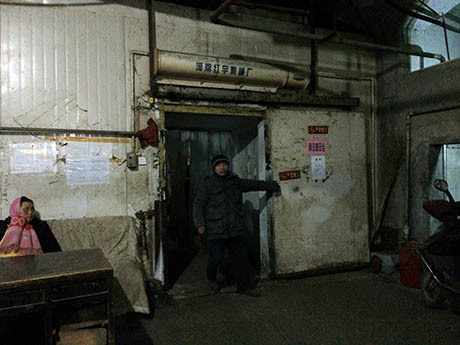 VIDEO: Dumpling inspection on the way into the freezer at the Sanquan factory, Zhengzhou. VIDEO: Boxes of dumplings enter the largest fully automated, “lights out,” refrigerated freezer in Asia, Sanquan, Zhengzhou. 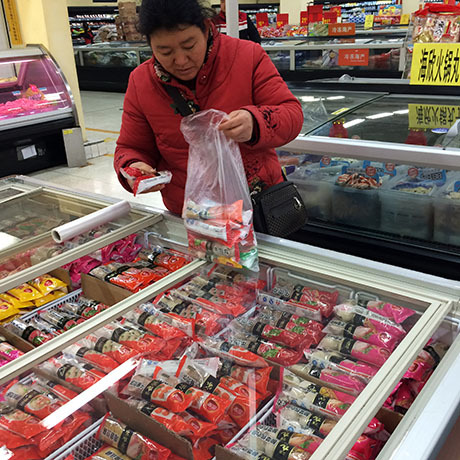 IMAGE: Shopping for Sanquan frozen meatballs at Wal-Mart, Zhengzhou. Zhengzhou, as those of you who have read my article know, is the capital of frozen food in China. “Think of Kansas City, but double the size,” explained Ralph Bean, who, as director of the United States’ Agriculture Trade Office in Beijing, is tasked with getting U.S.-grown ingredients into China’s frozen dinners of the future. In other words, it’s a third-tier city of nearly 9 million that boasts one brand new subway line (it opened in January) and three Wal-Marts. I visited the Manhattan Plaza branch in order to spot Sanquan dumplings in the wild, and to see who bought them, and why. This lady explained that she liked them because they were a new, modern kind of product.”They didn’t exist before,” she said, as if that were reason enough to have them for dinner. Meanwhile, the packaging emphasised frozen food’s classiness (“enjoy the elite flavour”) and convenience, listing the “Three Withouts”: you can eat these without chopping, without having to wash anything, and without seasoning. The store’s tiny frozen food section was dominated by dumplings, with some dubious-looking meat popsicles and a lonely “Children’s Steak” ready-meal rounding out the options. Elsewhere in the supermarket, store-made fresh dumplings were for sale behind a sneeze-guard and raw meat was laid out on ice and handled with tongs, in stark contrast to the Zhengzhou wet market (see destination 3, below). But fish is sold live, even at Wal-Mart, and the front wall was covered with scoop-your-own seafood tanks. IMAGE: Wal-Mart’s scoop-your-own seafood tanks. 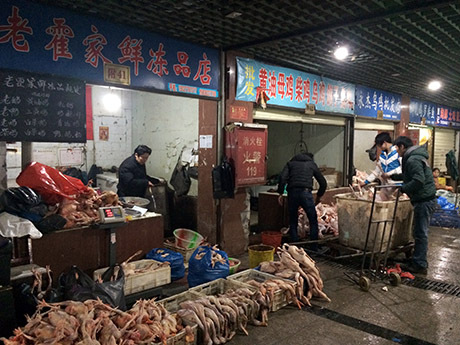 IMAGE: Chicken for sale at the wet-market, Zhengzhou. Zhengzhou’s largest wet market happened to be right next to my hotel, which made the 5 a.m. start to visit it a little easier (but not much). These chicken had been slaughtered at the farm this morning, the vendor explained, and he would sell them all today. 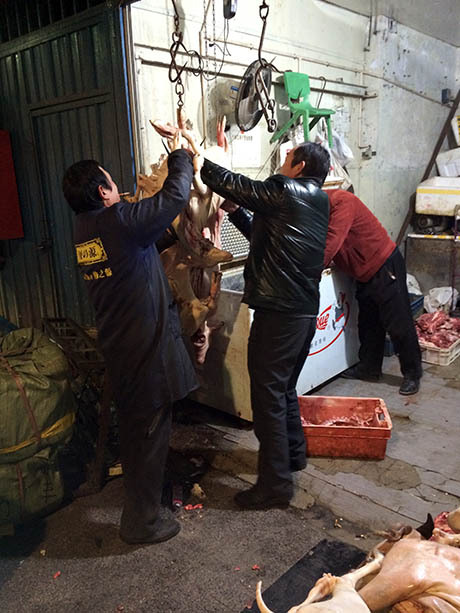 IMAGE: Hanging a carcass without having to put your cigarette down is a two-man job. 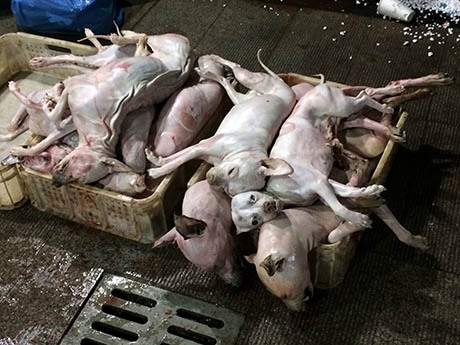 IMAGE: Freshly skinned dog carcasses. Other vendors had their own small freezer chest, or rented space in the refrigerated walk-in beneath the market, but they all explained that their customers preferred fresh meat. In January, they told me, rabbit and dog stays fresh in the open air for a couple of days at least; duck lasts two or three days; and mutton can sometimes be fine for nearly a week. 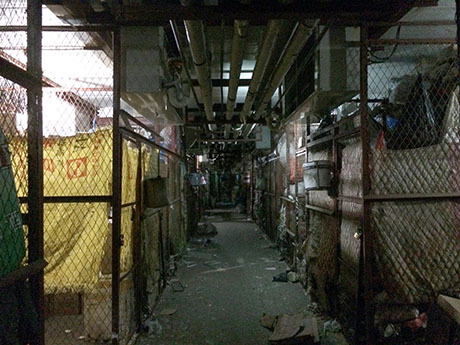 IMAGE: The entrance to the wet-market walk-in refrigerator. Once I saw the market’s communal refrigerated walk-in, with its funky smell and collapsing cardboard boxes piled high on the concrete floor, the pervasive idea that unrefrigerated, but freshly slaughtered, meat was fresher than its refrigerated counterpart made a lot of sense. Tim McLellan, a tireless advocate for all things cold chain and a director at Preferred Freezer Services, an American company that is about to open its third cold-storage warehouse in China, told me that, while touring some of these older facilities, he had even seen rats. When I expressed surprise that they could survive in the cold, he explained that they live inside the wall insulation, and brave the chill to chew through boxes and gorge themselves. 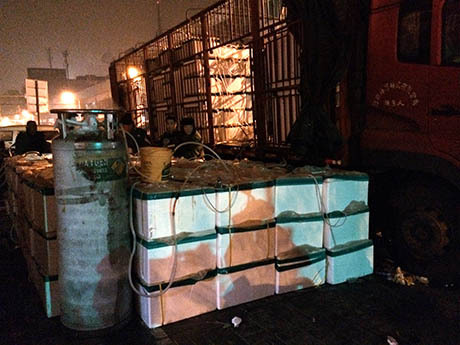 IMAGE: Live fish transportation requires an octopus-like exoskeleton of liquid oxygen hoses. Outside the market, men unloaded a lorry-full of live fish, which is transported using an incredibly complex truck-bed system of Styrofoam boxes, running water, and oxygen tanks, all laced together with a spaghetti-like profusion of hoses. 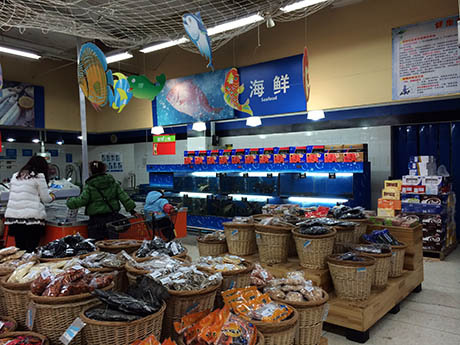 As in Wal-Mart, so too in the wet market: in China, fish is just not fresh unless it’s still alive. 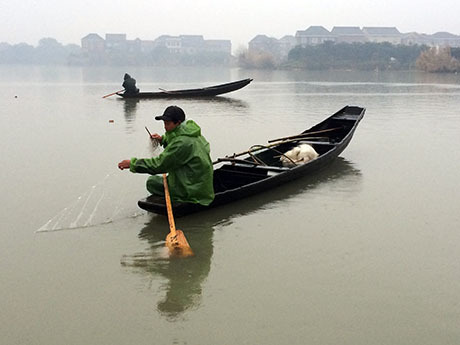 IMAGE: Catching my dinner, Hangzhou. The freshest fish I ate in China, however, was at a restaurant called Longjing Caotang, in Hangzhou. Dai Jianjun, its chef-owner, serves a “prelapsarian Chinese cuisine,” to borrow Fuchsia Dunlop’s description from her wonderful New Yorker article about the place. Everything I ate had been pickled, dried, preserved in-house, or freshly foraged that day. 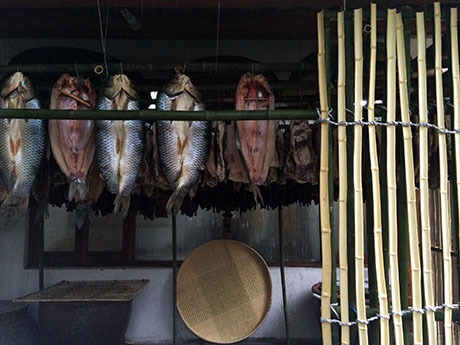 IMAGE: Dai’s bamboo fish-drying hut. Dai’s depth of knowledge about traditional Chinese flavours — he can and did talk for hours about the importance of orientation and bamboo-rod spacing when wind-drying sausages, or the under-appreciated difference between small-leaf and large-leaf pickles — is only matched by his dislike for all things modern. “City food gives me the shits,” he said, before quoting two ancient Chinese philosophers to explain that agriculture had first gone wrong by harnessing oxen to the plough, rather than relying on manpower alone. But, though it’s easy to laugh at his quirks and disagree with his fetishisation of some kind of Utopian, originary foodscape, Dai is almost single-handedly managing to preserve and revive the kinds of micro-local, pre-refrigeration techniques and flavours that are increasingly rare in contemporary China. The unfortunate thing is that, on the one hand, the economic boom and things like more modern food distribution systems and cold chain allows for a far more varied diet for many people in China — but it’s a varied diet in which a lot of the traditional foods are dying out. 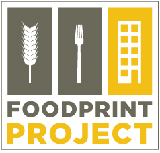 They desperately need a Chinese Slow Food movement. You’re simply not going to be able to find a lot of those traditional foods as capitalism develops and people can’t or are not willing to invest time in food preparation. And, of course, food safety regulations make it harder for a lot of the traditional practices and enterprises to continue. The knowledge is disappearing, and I think that’s a real shame. I sincerely hope Dai’s fish-drying hut is not also an endangered species. Nonetheless, no Chinese cryo-tour would be complete without a stop at Longjing Caoting, to experience the kinds of foods that refrigeration — and its companions, urbanisation and a rising GDP — threaten to make extinct. IMAGE: Owen Guo, my wonderful interpreter and fixer, being instructed in the art of sending fish to sleep. Fish are the anti-frozen dumpling: unlike Chen Zemin’s rice balls, they have no legs, both literally and metaphorically. But, at China’s National Engineering Research Centre for Agricultural Product Logistics in Jinan, sandwiched between the “Time/Temperature/Tolerance Laboratory” and “Small-size Instruments Storage,” the curious cryo-tourist can visit “The Room of the Sleeping Fish.” As I describe in a forthcoming issue of Harvard Design Magazine, the Centre’s scientists have developed a way to ship live fish out of water, by using refrigeration to induce a sort of suspended animation. According to the technician in charge of the process, the fish are sent to sleep by gradually lowering the temperature of the water, half a degree at a time over the course of twenty-four hours, to just above freezing. In this sluggish state, a fish can be rolled up, popped in a clear plastic poster tube, and mailed to anywhere in China. As long as they arrive at their destination within three days, the Centre’s Director explained, they will simply wake up and start swimming again as soon as you slide them out of the canister. What’s more, he added, these revived sleeping fish taste better than the freshest just-caught fish: the whole process is apparently the piscine equivalent of a spa retreat, and the less stress, the better, as far as fish flesh and flavour are concerned. 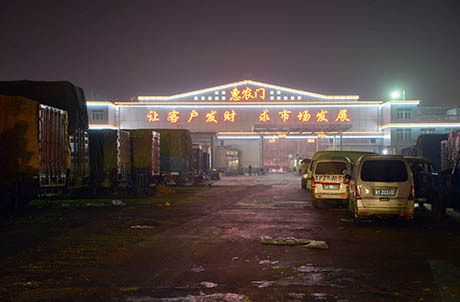 IMAGE: The neon entrance gate to XinFaDi market. According to official statistics, less than five percent of China’s vegetables are transported under refrigeration. An early morning visit to the XinFaDi wholesale market, which supplies more than 70 percent of Beijing’s vegetables, demonstrates the reality behind that figure. 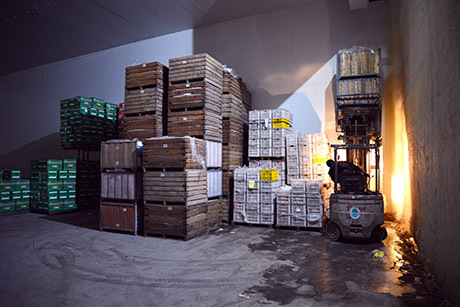 Eggs, grains, oils, and, curiously, mushrooms are all sold from inside a covered structure, but fruit and vegetable transactions are handled in the parking lot, at the back of each delivery truck. IMAGE: Check out the little kid perched on top of this banana truck. And, of course, the trucks are not refrigerated. Instead, vendors pack the vegetables tightly under layers of blankets, ice, and even hay, excavating each radish or head of broccoli individually for their customers. As I explain in the story, it’s thus perfectly normal for a quarter of the cargo to rot before it can be sold — more in summer. 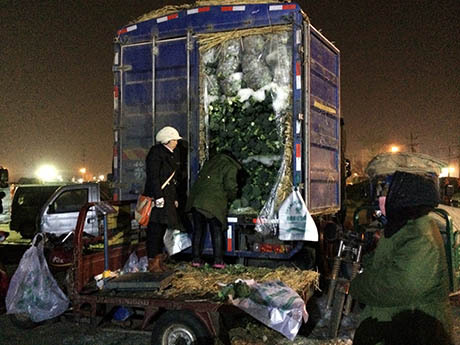 IMAGE: Ice-packed broccoli being dug out from the back of the truck for a customer. 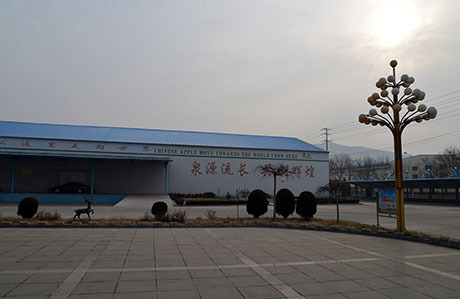 IMAGE: Yantai Quanyuan Fruit & Vegetable Co. Ltd.
“Chinese apple move toward the world from here,” proclaims the slogan on the side of one of the largest modified-atmosphere, refrigerated apple-storage facilities in China. Quanyuan uses German-designed equipment to store the apples at 0 degrees Centigrade. Flushed with nitrogen, in order to remove oxygen and slow respiration still further, the apples stay fresh for a year. The company exports its product across Asia, to Africa, and, most recently, to Canada. Soon, they hope, their apples will be allowed into the United States. 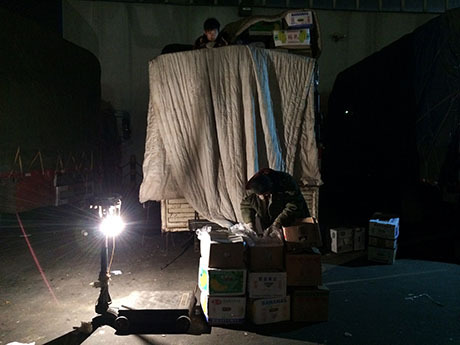 IMAGE: Loading apples in the cold storage warehouse at Quanyuan. 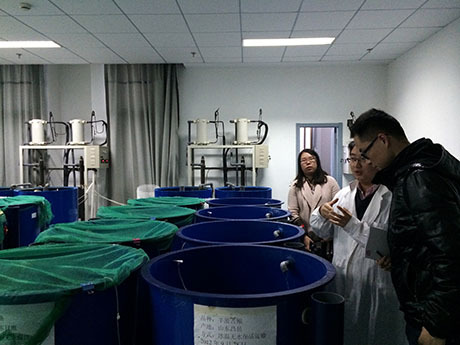 The modified-atmosphere technology, which is standard in the United States, was introduced to the Chinese apple-growing region of Yantai in 1994, and it has changed everything for Quanyuan. 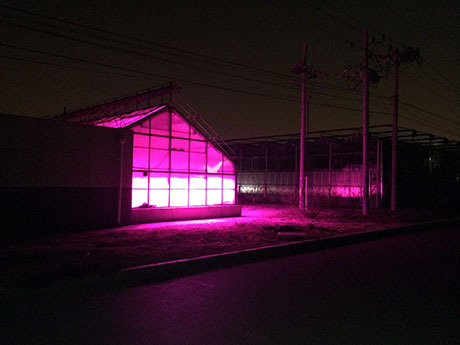 IMAGE: An experimental greenhouse, Beijing Vegetable Research Centre. Liu Sheng, at the Beijing Vegetable Research Centre, is developing the optimal post-harvest regimes for Chinese produce. These were developed for British fruit and vegetables beginning in the 1920s, and UC Davis’ Post-Harvest Technology freely disseminates separate sets of specialised guidelines perfectly tailored to the unique metabolic profiles of Anjou pears and Bartlett pears, or Red Delicious apples and Golden Delicious apples. “We have some for Chinese vegetables, but ours are not as specific,” Sheng explained. “We have a single standard for thirty different fruits!” He spends his time measuring loss rates between batches of bitter melon that have been hydrocooled versus those that have been exposed to forced-air precooling, and assessing organoleptic deterioration in hawthorn berries when stored at 3 as opposed to 4 degrees Celsius. Personally, he is a big asparagus fan. Sheng also helped plan one of the Party’s flagship cold chain projects, the “South to North Vegetable Transfer.” Launched in 2011, this “Pilot Program of “Modern Agricultural Circulation” aimed at repurposing the country’s southernmost, tropical island province, Hainan (otherwise popular with Chinese honeymooners), into the “National Winter Vegetable Base,” complete with 30 brand new logistics centers and an express refrigerated rail-link to Beijing. In other words, just as drought conditions in California are driving up fruit and vegetable prices across the United States, the Chinese are racing to turn Hainan into their Central Valley. 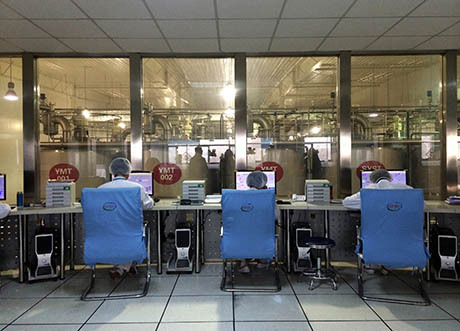 IMAGE: The Yogurt Control Room at Yili’s Wuqing plant. A traditional Chinese diet involves very little dairy: cheese is viewed as disgusting, butter is indistinguishable from cheese, ice-cream is only for kids, and the majority of the population is lactose intolerant. But, with the temptation of such a huge market, and equipped with a growing cold chain through which to reach it, both international and Chinese companies have pushed a “yogurt strategy” to “reintroduce dairy,” as Chris Brimlow, Nestle’s Director of Research and Development in China, told Paul Roberts in The End of Food. Yili is the market leader, achieving success with its locally attuned flavours (sweetcorn and aloe, as opposed to Danone’s strawberry) and with a clever marketing campaign that pushes yogurt as good for teenage complexions. I visited the newest of its ten yogurt factories, in Tianjin, built to anticipate a demand that is projected to grow by 20 percent year-on-year for the next decade. 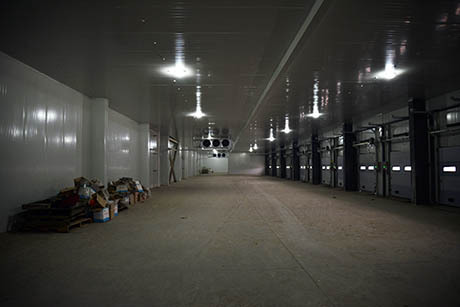 IMAGE: Refrigerated loading dock at Liu Peijun’s brand-new refrigerated warehouse. Liu Peijun got his start persuading wary Beijingers to try Sanquan’s frozen dumplings back in 1996, when they first reached the capital’s supermarkets. He personifies China’s new wave of homegrown logistics entrepreneurs: ambitious (he is expanding to Shanghai), successful (a Jeep, a BMW, and plans to send his son to college in the U.S.), and as frustrated by the missing links in China’s cold chain as he is proud of his pioneer status. We went out for Mongolian hotpot to warm up after our refrigerated warehouse tour. As I struggled with how exactly to eat a duck’s tongue, he said, “I have to admit, business is good.” From the way he smiled, it was easy to tell that business was very good indeed. In fact, Liu added, cold chain logistics is so hot in China right now that the interpreter he brought with him last year on a fifteen-day research tour of refrigerated warehouses overseas quit as soon as they got back to Beijing, in order to start a cold storage business of his own. 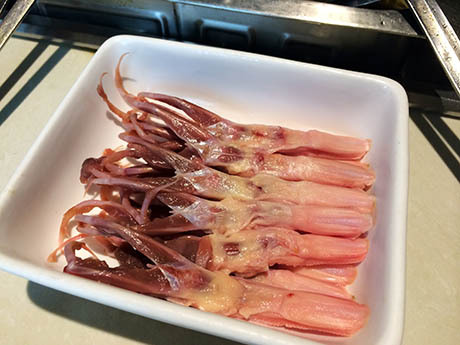 IMAGE: Ducks’ tongues consist almost entirely of cartilage, making them tricky interview-fare for the non-native diner. There are far too many people I have to thank for making this New York Times Magazine story, and the opportunity to explore the Chinese cryosphere, possible: the UC Berkeley Food & Farming Fellowship crew; my superstar interpreter, Owen Guo (and Josephine Lau, who introduced me to him, via my old friend Dechen Pemba); my skilful editors Bill Wasik, Claire Gutierrez, and Jon Kelly; my tireless fact-checkers Karen Fragala-Smith and Dan Kaufman; the anonymous folks on the copy desk (“fridge” is not allowed, according to the NYT style guide, FYI) and the rest of the magazine team; my first and favourite editor, Geoff Manaugh; and so many people who spoke to me, hosted me, recommended me, and introduced me to others — Jen Lin Liu, Fuchsia Dunlop, Corey Rosenbusch, Judith Farquhar, Steve Boucher, Tim McLellan, Ralph Bean, Jim Harkness, Susanne Freidberg, Mike Moriarty, Ram Krishnan, Jackie Janus, Mark Bills, Clyde Verhoff, Tianle Chang, Richard Brubaker, Piao Li, Soonguan Poh, Liu Peijun, Chen Zemin and Chen Nan, Feng Shaotong, Wu Jianfeng, Mr. Mu, Zhang Li, Wang Guoli, Jiang Xu, Jiang Yuanquan, Qin Yunming, Liu Sheng, Chairman Wang, Black Sesame Kitchen, Hugo Lindgren, Rob Walker, John Thackara, and Alexis Madrigal. Thank you! This entry was posted in Artificial Cryosphere, Uncategorized. Bookmark the permalink. Trackbacks are closed, but you can post a comment. I read your article in the NYT and enjoyed it immensely without realizing it was by you. 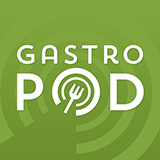 I don’t know if you remember me – I was the UVM student involved in the short-lived Grist food studies series with you. I’ve since moved on to Drexel as a professor, and I wanted to let you know I noted down your piece as potential reading for future food-studies classes. The cultural revolution of the expansion of the square refrigeration in China is a fantastic mirror in which to consider our own attitudes to food, as well as a great story. The relation between fluorocarbons released by refrigeration to global warming is even more striking if one notes the greater tolerance (and lower controls) over CO2 emissions in China–and the poor Air Quality Index in much of industrialized China, revealed in the unequal distribution of concentrations of air pollution in China, particularly along the Yellow River and in Shangdong province. I’ve used some of the maps of particulate matter on a Google API to address the uneven distribution of the effects of industry on the biosphere at http://wp.me/p36T6t-1Ph; the boom of refrigeration in China suggests even greater disparities in the release of fluorocarbons without any regulation. Thanks for the great piece!